Well I have never done a cake tutorial before but I have been inundated with requests on how to make this cake. As I have said in my other blog here Baking My Way (also check it out for more cake tips) I am NOT professional and totally self taught but I love baking and sometimes I want to tear my hair out mid cake or I could go on forever but I just haven't got the time, but what's the worst thing that can happen from having a go?! I am not going to share recipes today you can use your own, this is about how to assemble it. 1. Bake a base cake.... try not to burn it slightly like me, the kids were winging for toast but still tasted fine... the size is up to you but put two sizes between top layer for example 10inch and 8inch. We were having a lot of people so I needed a lot of cake and I went for a 12inch base and 8inch top cake. I made Madeira here because its strong but moist sponge to hold all the stuff on top. 2. Bake a top cake, I went for Chocolate and let both the cakes completely cool. 3. Even the Madeira bottom layer out by cutting the dome off the top...and in this case pick off some burnt bits and then I used some of the soft offcuts to stuff the holes. 4. Split the Madeira in two. Now I didn't take a pic of this but what I do if I'm not confident it wont look like a mountain range I take a cocktail stick and with a pen I mark half way on it and stick a cocktail stick in at that point then I use my "measuring cocktail stick" and put 3-4 more in around the cake at the same spot so it now looks like that game Caplonk. Then I slice in using the cocktail sticks as a guide and your get two even smooth layers. 5. I then evened out the top Chocolate layer, I baked this in two layers anyway so only had to trim the dome tops. 6. I made two batches of butter cream. I then spread a thick layer of Nutella on one side of the Madeira and then a thick layer of butter cream on the other and sandwiched them together. 7. I then dirty iced the Madeira cake which means cover in butter cream and don't worry about the crumbs and that it looks "dirty" it sealing in the cake and evening it out ready for the fondant. 8. I then repeated the exact same thing with the Chocolate cake. 9. I let them set a bit and then dirty iced both the cakes again as they needed it -sometime once is enough you judge. 10. 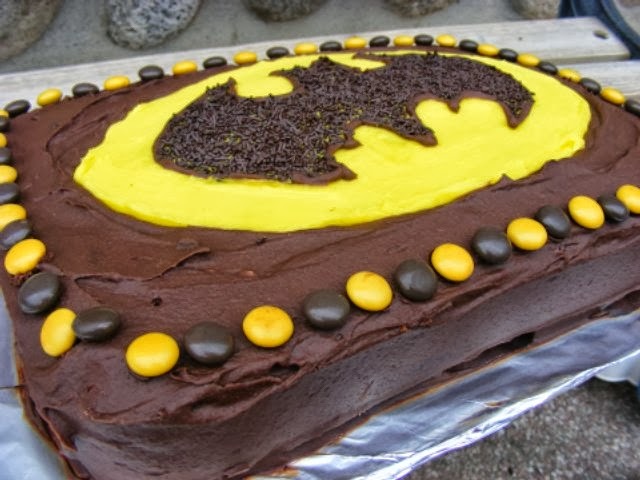 I then made some grey fondant icing to go with my Batman theme, by mixing some black food gel with white fondant, it went all marbled and normally I would keep kneading until completely blended but I loved this look for my cake so just left it. 11. Place the cake on a cake board mine was a 16inch. OK now the bit people dread -covering the cake- but don't its so easy once you have tried it just once. Sprinkle the bench with icing sugar or cornflour and roll out to about 1cm thickness and make sure its big enough to cover the entire cake. 12. Some people then roll this onto a rolling pin and un-roll it onto the cake but I prefer and specially when its this big I just move the cake close and pick up the fondant like a blanket and quickly drape it over the cake - if its not right quickly move it around YOU are in charge not the icing! Then pull and smooth all the wrinkles out and smooth the top and side with the palm of your hand. - Any doubts just look on Youtube for loads of videos. 13. Trim the edges off. 14. Repeat with the chocolate cake, I used bright yellow and bought it because it would have taken for ever to mix it to this colour. 15. Then score 4 lines into the top of the cake and gently peel back the triangles. 16. Put the top layer into the gap, some people use dowels (sticks) for support but I didn't and it was fine. 17. Score 4 lines into the top layer and peel back. I did this then had to go and pick up some balloons which was stupid because it dried out and got what we call "Elephant skin" so do it all in one and it will be fine....I didn't care anyway! 18. I then disinfected the toy despite being brand new and wrapped in cling film including the cape so it didn't get dirty. 19. Now when I made the Ariel cake below a while back I used a cutter and cut a hole out of each layer for the legs but Batman here being a typical man has his legs wide open and the hole would have been too big so I just rammed him into the top. 20. I then rolled the triangles under on themselves all the way round on both cakes. 21. I then rolled out the left over grey icing again and just with a sharp knife scored triangle pieces out and tucked them around the cake to make it look like he was bursting out. I then built the triangles up to three layers and curled some of the edges over -repeat on top cake with yellow icing. Oh and take off Batman's hostage mask! 22. I then rolled out some black icing and cut out - some stars, Archie, Pow and Biff...naturally. I then stuck it all onto the cake with some water. 23. I used some cake wire and put some stars on them. When they were dry I pushed them into the cake and put a black ribbon around the bottom of the cake board, secured with a pin. 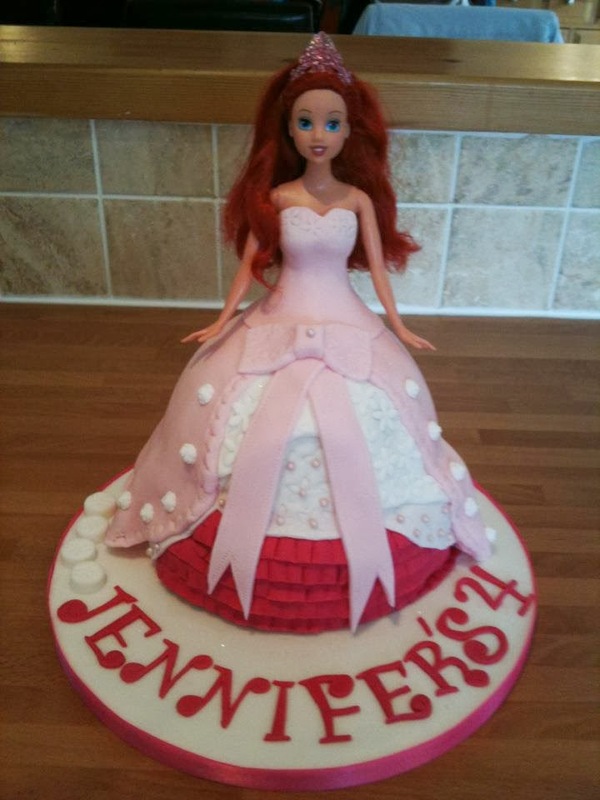 *Obviously you could just buy two cakes, stick a figure in and decorate/personalise if your not confident at baking. The funny thing is though after I had slaved making the cake I went on google images to check there wasn't anything I had missed and Archie spotted a cake and said "Ah Mammy that cake is amazing can I have that one?!" this was it and it just shows they appreciate the effort no matter how small! No offense to who ever made this looks very tasty but I could have saved myself a few hours had I know ha ha!